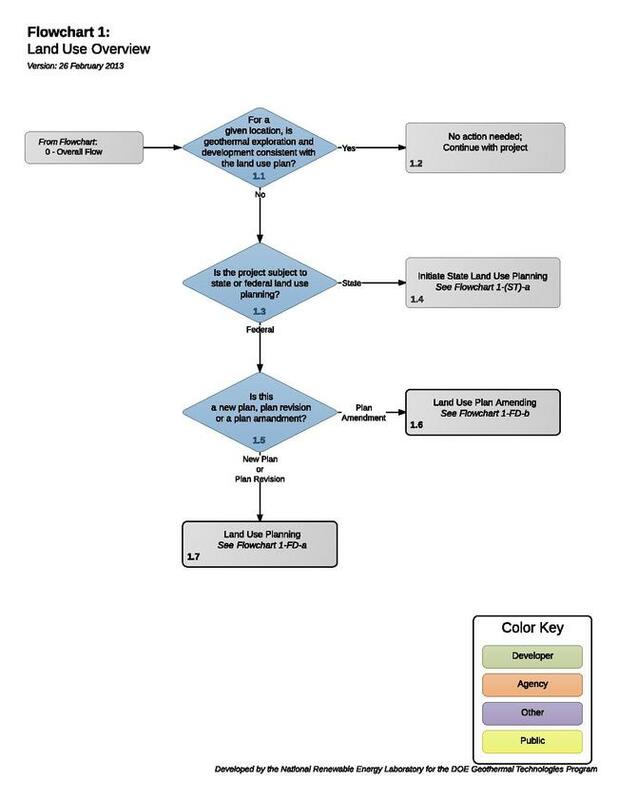 Land Use Plans (LUPs) are used by local, state and federal agencies to manage public lands and they form the basis for every action and approved use of those lands. Different agencies will refer to LUPs by different names, but all LUPs serve the same purpose; to dictate what actions can and cannot be taken on the managed unit of land. Non-conforming uses require a LUP be amended or revised before a right-of-way or special use permit can be authorized. In addition, some state and local land may be governed by state LUPs. A developer should check to see if a LUP is applicable to the project site, and if so, whether the LUP allows for utility-scale geothermal development. If the LUP does not allow for utility-scale geothermal development, the developer should initiate the state or local land use plan amendment process. Before approval of a notice of intent to conduct exploration (NOI), Geothermal Drilling Permit (GGDP), or sundry notice operations plan, an onsite inspection will be conducted with the operator to further identify site-specific resource protection concerns and requirements. Prior to, or in conjunction with, the onsite inspection, the surface management agency will advise the operator of any special inventories or studies that are required, such as for cultural resources or threatened and endangered species. 1.1 to 1.2 - For a Given Location, Is Geothermal Exploration and Development Consistent with the Land Use Plan? The Federal Land Policy and Management Act of 1976 requires the Bureau of Land Management to use land use plans to manage resources in a manner consistent with Congress' intent. Most federal, state and county governments will have similar land use plans. The developer should consult the applicable land use plan to determine whether the project is consistent with the current land use plan. 1.3 to 1.4 - Is the Plan To Be Addressed for State or Federal Land? State LUPs may govern some state lands. A developer should check to see if a LUP is applicable to the project site, and if so, whether the LUP allows geothermal development. If the LUP does not allow for geothermal development, the developer should initiate the state land use plan amendment process. 1.5 to 1.6 - Is This a New Plan, Plan Revision, or a Plan Amendment? This page was last modified on 29 August 2018, at 13:25.